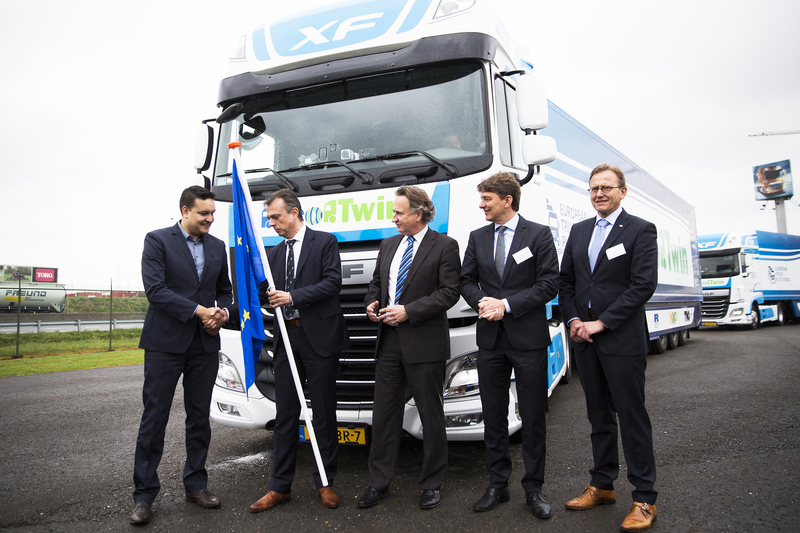 EcoTwin leaves from Westerlo - DAF Trucks N.V.
"Belgium will strongly support continued development of truck platooning in Europe." With this pledge, Christophe Leurident, advisor to the Belgian Mobility Minister Jacqueline Galant today gave the green light for the departure of the EcoTwin truck platoon in Westerlo, on its way to the European Truck Platooning Challenge. On Wednesday 6 April, the EcoTwin combination, the result of close collaboration between DAF, TNO, NXP and Ricardo, will be greeted at around midday by the Dutch Minister of Infrastructure and the Environment, Schultz van Haegen at Maasvlakte near Rotterdam. Photo caption: Kick off European Platooning Challenge at DAF axle and cab plant in Westerlo, Belgium. From left to right, Christophe Leurident (Advisor Belgian mobility Minister Galant), Ron Borsboom (Director of Product Development DAF), Maurice Geraets (Director New Business NXP), Leo Kusters (Managing Director Urbanization TNO), Gert Liefting (Managing Director Ricardo Netherlands). The European Truck Platooning Challenge is an initiative introduced by the Dutch Ministry of Infrastructure and the Environment, with the aim to gain approval for the large-scale, pan-European testing of truck combinations (‘platoons’) that are linked wirelessly. This functionality enables the trucks to drive on closer following distance, which provides benefits in terms of fuel consumption, CO2 emissions, road safety and traffic flow. Truck Platooning uses automated driving technology to allow trucks to drive a short distance apart. The second vehicle automatically follows the first using Wi-Fi, radar and cameras. One unique aspect of the EcoTwin combination is the Wifi-P connection developed by NXP. This allows the second truck to respond up to 25 times more quickly than a human-being, and the following truck slows down before our eyes even perceive that the vehicle in front is braking. Wifi-P also allows drivers on board the DAF trucks to talk to one another, and a large screen in the second truck displays what the driver of the first truck can see up ahead (‘See Through’). "It goes without saying that a lot of development is still required before we can introduce platooning as a new technology on the road network", says Ron Borsboom, member of DAF Trucks' Board of Management and responsible for product development. "This process will certainly not be completed before 2020. A great deal still has to be sorted out in terms of legislation, liability and acceptance." "Belgium will do its utmost to enable truck platooning tests on public roads in order to gain more experience", explained Christophe Leurident, advisor to minter Galant. "It's now up to European politicians to make this possible, and together with the Dutch minister Schultz van Haegen, we would like to put our combined weight behind these efforts." ‘EcoTwin’ is a consortium comprising DAF Trucks, TNO, NXP and Ricardo, with each party contributing its own specific knowledge and experience. NXP provides the wireless, state-of-the-art communication system between both vehicles through the use of cameras, sensors, radar and Wifi-P. As a leading consultancy firm, Ricardo provides advice concerning the functional safety of the systems. TNO is responsible for the development and integration of the complete package of new technologies. In addition to the integration of all systems in the vehicles, DAF Trucks is responsible for all testing. The DAF Axle and Cab Factory in Westerlo was selected as the starting point for the EcoTwin combination's journey because this year marks the 50th anniversary of DAF starting production in Belgium.